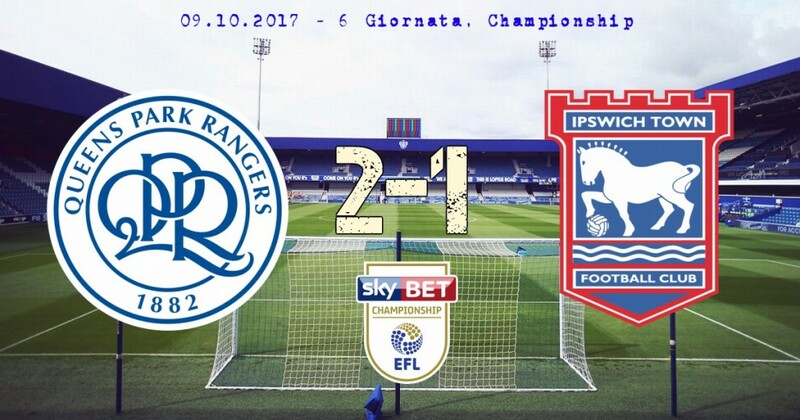 QPR (3-5-2): Smithies, Robinson, Onuoha, Baptiste, Bidwell, Freeman, Scowen, Luongo, Wszolek (77′ Wheeler), Mackie (82′ Lua Lua), Washington (82′ Smith). In panchina: Furlong, Bright, Manning, Lumley. Ipswich (4-4-2): Bialkowski, Knudsen, Iorfa, Spence, Connolly, Waghorn (67′ Sears), Downes (66′ Adeyemi), Skuse, Ward (76′ Celina), Garner, McGoldrick. In panchina: Danny Rowe, Gerken, Woolfenden, Kenlock. Marcatori: 43′ Mackie, 49′ Freeman, 89′ Celina. Ammoniti: 34′ Downes, 90′ Freeman, 95′ Connolly.